EWG scientists reviewed Organic to Green Coco Oil Liquid Coconut Oil, Lemon for safety according to the methodology outlined in our Skin Deep Cosmetics Database. We assess the ingredients listed on the labels of personal care products based on data in toxicity and regulatory databases, government and health agency assessments and the open scientific literature. 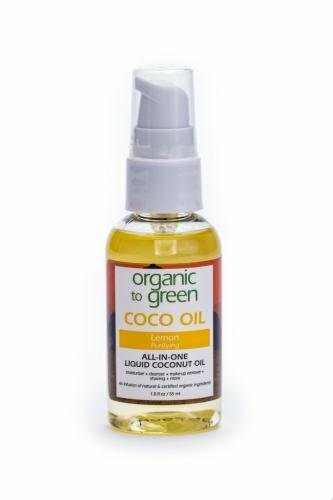 Organic to Green Coco Oil Liquid Coconut Oil, Lemon is EWG VERIFIED™. Perfect for use as a facial cleanser, make-up remover, styling aid and hydrating aid for hair, shaving aid, bath oil, face & body moisturizer, eyes & lip protector, and scrub (just add a little salt or sugar). Great for the entire family including children and babies!